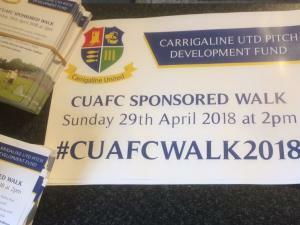 We are looking forward to hosting our first Sponsored Walk on Sunday 29 April. We are aiming to raise funds for our upcoming all-weather pitch development at Ballea Park. The walk will begin at Drake's Pool car park at 2pm and finish at Ballea Park where there will be lots of fun activities and spot-prizes for our walkers. It promises to be a great day out for all the family so make sure to get involved!